First of all, what is Google Webmasters Console? Google Webmasters Console is Google’s interface and communication channel between webmasters and Google. They found that while than passively indexing websites using web spiders was effective, sometimes webmasters simply didn’t know something on their website was lacking (e.g. dead links, excessive load times, etc.). So this is their way to actively let webmasters who opt in to communicate know. How do I use Google Webmasters Console? This is not a guide to go through all parts of the tool, as it’s constantly expanding in features. Google has been spending a fair bit of time recently bringing in the Google Webmasters Console and Google Analytics together. One of the things that Google needs you to do to get started is to prove you are indeed a webmaster and own the domain/ subdomains that you are looking to manage. Of these, I personally find the Domain name provider as the easiest solution. If you provider is not listed though, this step may not be possible. So you will need to consider the other options. I will show you how to verify your website using the HTML tag verification option. There will be an option to add your “property” to the Google Webmasters Console. Click on the “Add Property” button to do so. 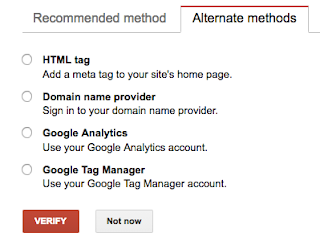 Select HTML tag, where we will need to add a meta tag to your site’s home page. Go to your HubSpot portal. Find “Content Settings” under “Content” and then find a section called, “Site Header HTML” and add in the meta tag that Google would have provided to you. Once you have set this up on HubSpot, scroll down and click the blue “Save” button. Click “Verify” on Google’s Search Console so that they check your website for the meta tag. You should have a confirmation of success. If it is not working, you may need to explore other options to prove that you own the website URL that you are asking Google to allow you to manage as a webmaster. Please reach out to Google Webmasters Central Help Forums for help if you get stuck. As HubSpot Support won’t have access to Google’s system. Here are some common verification errors mentioned by Google below. The connection to your server timed out. We were unable to verify your file because we received a server timeout. This could be because your server is down or is busy and responding slowly. Make sure that your server is responding and try again. We encountered an error looking up your site’s domain name. We tried to access your verification file, but were unable to access your domain due to a DNS error. This could be because your server is down, or there is an issue with the DNS routing to your domain. Make sure that your domain is resolving correctly and try again. The download request was redirected too many times. Check the URL for potential issues, such as an infinite loop. Your server returned an invalid response. This can happen if your site is requires password authentication, or if we cannot access it for other reasons. Make sure that your server is not down, and that your domain is resolving correctly, and try again. If this problem persists, check the Webmaster Central Help Forum for updates.